On November 9, 1827, Teodora Morales Alonzo Realonda de Rizal y Quintos, the mother of Philippine national hero Jose Rizal, was born in Meisik, Tondo, Manila. She was known for being a disciplinarian as well as a dedicated, courteous and hard- working mother. As the young Rizal's first teacher, she had a profound influence on his development and was his inspiration in taking up medicine. Teodora was the second child of Lorenzo Alonso and Brijida de Quintos. In accordance to the decree issued by Governor-General Narciso Claveria in 1849, their family adopted the surname "Realonda de Rizal". Coming from an able family, Teodora had her formal education at the Colegio de Santa Rosa in Manila. Just like her mother, she was well-educated and highly cultured. 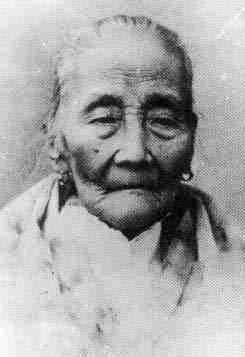 She was 20 years old when she married Francisco Mercado of Biñan, Laguna in 1848. They settled in Calamba, Laguan and to them were born eleven children namely, Saturnina, Paciano, Narcisa, Olimpia, Lucia, Maria, Jose, Concepcion, Josefa, Trinidad, and Soledad. The Rizal family was primarily engaged in agriculture. As the mother of a perceived enemy of the Spanish authorities, Teodora was often persecuted. In 1872, she was imprisoned for two and a half years on trumped-up charges of poisoning her brother's wife. In 1891, she was made to walk fifty kilometers to Sta. Cruz, Laguna, for failing to use her hispanicized surname, Realonda de Rizal. She had insisted on using Alonzo. Her family was ejected from their lands in Calamba due to a land conflict after which they relocated to Manila. “To my dear mother, Sra. Da. Teodora Alonzo. 6 o'clock in the morning, December 30, 1896. Jose Rizal." "My family has never been patriotic for the money. If the government has plenty of funds and does not know what to do with them, it's better to reduce the taxes." On August 16, 1911, Jose Rizal's mother died in her home in San Fernando Street, Binondo, Manila. Fitting honors were accorded her at her funeral.